Those of you know me, know that I'm 100% girl. Not a tomboy - never have been. I grew up playing with Barbie and was one of those girls who put my makeup on after leaving the house. I quickly became an expert at applying eyeliner on the bumpy bus ride to middle school. I grew into a woman who loved makeup so much that I became a licensed esthetician and branded my own line of cosmetics for heaven sake. Then I gave birth to a little boy and my world forever changed. I was introduced to Matchbox cars, snakes and bugs, little shoes covered in mud, and the almighty building block. 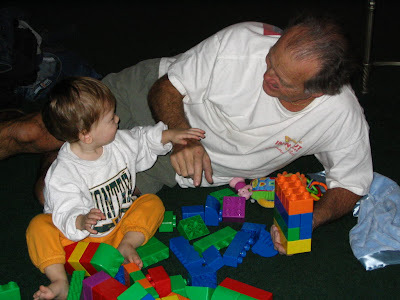 From the time Dylan was 16 months old he was playing with these large plastic things, Mega Blocks, that seemed to entertain him. It didn't take long until he was playing with LEGO Duplo and then it happened. I bought him a LEGO set when he was 4 years old and shortly after took him to LEGOLAND. I made my first exceedingly large purchase to the LEGO store when he was 6 years old. Not realizing what I had started - until I saw the excitement on my child's face - and our world has never been the same. Wooden blocks? Yeah, he played with them at preschool but never really asked for them at home. Rather than build something with the blocks, he would sort them by shape. He had Lincoln Logs and those seemed good - for a little while anyway. He made fences for his animals and would build the log cabin. I recently wrote an article for OC Moms about why building blocks are great gifts for kids and after doing some research I learned a lot about the different types of blocks that are available for children. And over the years I have learned that the world of LEGO isn't so bad - I actually like building with them - but don't tell my son that. It might tarnish my reputation of being a girly-girl. I really hope that Santa brings him what he wants this year because I want to help build the Millennium Falcon! What kind of building blocks do your kids play with? Do they have a special LEGO set on their Christmas list?